Posted on February 22, 2019 by Greg Kaz. If you are the owner of a flat or low-slope roofed building (whether residential or commercial), and you are in need of a new roofing material, you might have already heard of EPDM. Experts in building and design have long known that it is a remarkably durable material that installs easily and comes with a very budget-friendly price. In this guide, we’ll also look at the typical EPDM roof life expectancy and just why it is probably an optimal solution to your roofing needs. EPDM is an oil-based rubber material that can be easily applied to a flat or low-sloping rooftop. It is often described as a DIY-friendly material, too, because it does not involve any specialized skills or tools to install correctly and effectively. Preparing the area properly is also going to have an effect on any EPDM roof life expectancy. Moisture – Any EPDM roof life expectancy can be shortened if the materials are applied to wood a foundation that is damp or retaining moisture. This can cause adhesives to fail or for trapped moisture to degrade the base materials quickly. Debris – The prep work before installation involves removal of old asphalt and oil-based materials, as well as ensuring there are no sharp surfaces or pieces of debris that could work away at the backside of the roofing, causing a tear or fracture in the future, and leading to leaks inside the building. Poor drainage – Preparing a roof for EPDM means ensuring that water drains away from the rooftop and into gutters. This means the installation of batten boards and other trim that channels water where it needs to go. It also means that installation requires flashing to help channel water away from vulnerable surfaces and/or joints between the EPDM and other parts of the building. A trustworthy EPDM guide can help you learn all about the appropriate steps to take before, during and after installation. Each of these steps can prolong or ensure the long EPDM roof life you desire. And just what is the average life span of an EPDM installation. Generally, experts know that a well done installation provides a property owner with 40 to 50 years of roof life, or more. Regular maintenance and inspections can detect any issues or signs of trouble and extend the life span of the roof for even longer. And though you might read that EPDM has a long life and can withstand exposure to such things as UV light, extremes of heat and cold, structural movement and more, it is also important to recall that it is a greener sort of roofing. Not only because it lasts for such a long time, though, but also because it takes much less energy to produce and when it is replaced in later years the original material is entirely recyclable. If you are considering a new material for a low-sloped or flat roofed building, you have several ways you can go. However, if you need a cost-effective, low maintenance and easy to install option that can last for many years to come, then it is EPDM. Available in different colors, thicknesses and widths, it can cover large or small areas affordably and over a very long span of time. Posted on October 11, 2018 by Greg Kaz. More and more people today are concerned with the environment and going green, and they want to make choices that are sustainable. This includes when it comes to the buildings they own and the roofs on those buildings, particularly in the commercial sector. Builders and buyers alike are looking for ways that they can create environmentally friendly roofing systems, and one of the best options on the market is EPDM, or Ethylene Propylene Diene Monomer. This material offers a number of benefits that help to make it an environmentally friendly product, and it could be the perfect option for your business. Energy efficiency is important, and this is one of the areas where EPDM can truly excel. The product is available in both white and black. This means that it can work well to accommodate different types of environments when it comes to being energy efficient. If the white EPDM is used in a climate that tends to be warm and get a lot of sunshine, it can help to keep the building cooler. The white will reflect the sunlight. This can help to reduce the use of air-conditioning. For those that live in colder climates, having the black roofing can help, as it will more readily absorb the sunlight to keep the building warmer. This means reduced heating costs throughout much of the year. In fact, a study conducted by Ashley-McGraw Architects have shown this to be the case. They found that using white roofing will provide 30% higher thermal heat loss than the black roofs. Another way that EPDM is environmentally friendly is in its durability. 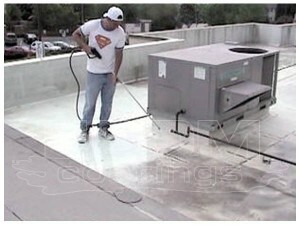 It’s very common for the coatings on roofs to last and stay in great shape for decades. They are not going to need to be recoated and repaired every year, which means less of the product is being used. Not only is this good for the environment, but it shows that EPDM is also a good value. A study by a strategic environmental consulting firm called GreenTeam, Inc. found that EPDM performs better than other similar types of roof assemblies. They found that it has a lower environmental impact than asphalt, TPO, and PVC roofing systems. Another one of the benefits of EPDM that helps it to last so long is the fact that it is not a rigid, inflexible material. You will find that the rubber can expand and contract with the weather, which means there is a far less likelihood of it cracking and allowing for leaks. If you want to have a quality roofing system that is environmentally friendly, you will find that EPDM tends to be fast and relatively easy to install. In fact, depending on the size of the roof, the slope of the roof, and the amount of time you have, it is a project that you could conceivably complete on your own. However, if you do not have the time or inclination to do it on your own, you can find some great roofing companies that can take care of the installation for you. During the application process, be sure to follow all of the guidelines from the manufacturer to ensure proper installation. This includes cleaning and preparing the roof before you begin, applying a single coat, and ensuring you are following safety guidelines while applying. Whether you choose to install the EPDM on your own or hire someone to do it for you, it is worth it. The peace of mind it can offer, along with the environmental friendliness, are priceless. Posted on March 25, 2014 by Greg Kaz. With all the advantages out there when it comes to roof coating, it’s understandable that you may want more information before making a decision. Your roof is important, after all, so anything but the best is taking a pretty big gamble. Keep reading to learn more about one option, an elastomeric roof coating. An elastomeric roof coating is one that greatly resembles rubber once it’s applied. One of the main advantages of this particular form of coating is that it can be applied to so many different kinds of roofs. There are many benefits to choosing an elastomeric roof coating. As mentioned above, it can be used on just about any surface type. This includes roofs made out of metal, single-ply applications, built-up applications, modified bitumen, and much more. It can even be applied to freshly sprayed polyurethane foam. The actual angle of the roof doesn’t matter, either. Unlike some other coatings that can only be used on buildings with a flat top, elastomeric coatings can handle those and ones with just about any type of slant to them. Once applied, an elastomeric roof coating will provide superior resistance against just about any weather condition. As it acts much like rubber, it can stretch when the temperature goes up and then retreat to its original shape when it gets colder out. By doing this, it resists cracking. Because of the strong seal this coating produces, it’s great for energy efficiency. Cold air and heat stay in, while the outside world is kept at bay. 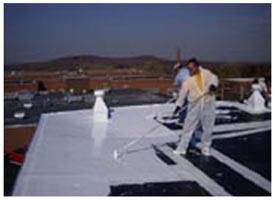 This is the most widely used elastomeric roof coating. It’s great for roofs with a positive slope, for one thing. It also displays superior longevity and is easy to clean. Furthermore, many people appreciate that it is considered an environmentally friendly option. For flat roofs or those with a low slope, butyl elastomeric is a great choice. It works especially well on roofs that are made from modified bitumen, asphalt built-up, or singleplied roofing. One advantage for flat roofs is that this variety can resist the pressure of pooling water. While EPDM roof coatings are considered high quality, adding a polyurethane elastomeric coating will further help ensure the roof’s overall protection. This variety is also especially good for roofs made from modified bitumen or a single-ply application of PVC or TPO. This is a great option for a roof that was recently treated with polyurethane foam. The main reason is that a silicone elastomeric coating displays excellent weathering. Whether the foam was just recently sprayed or needs a new layer for protection, this is a great choice. When you’re looking to coat your roof for added protection, it’s hard to think of a better option than the rubber-like elastomeric coating. It can be applied to just about any surface, and it will display excellent durability while adapting to weather conditions. With several different options to choose from, you can find the coating that will work best for your roof. EPDM Rubber has had a long history of superior performance in hoses, molded products, tires and roofing membranes. For example, the radiator hoses in our cars and the gaskets on our freezer doors are made of EPDM rubber and show the broad temperature range the product can handle. EPDM Roofing Membranes also have more than 30 years of successful history. EPDM is relatively inexpensive, simple to install, and fairly clean to work with when compared to conventional materials. There are not the strong odors and fumes either. The product is very stable and the resulting characteristics of Liquid EPDM such as flexibility, weatherability and chemical resistance are determined by it. Liquid EPDM therefore, can be described as a new form of an old and well-established rubber polymer. Now you can take advantage of the same benefits to weather-tight your leaks. Liquid EPDM forms a 100% seamless layer. No other product can match the durability of EPDM Liquid Roof. EPDM is essentially immune to the effects of ultraviolet and ozone and is one of the best water barriers known. EPDM also has the broadest temperature tolerance, and is not water-soluble even in the uncured state. Even if you happen to get a unexpected rain shower just after you applied Liquid EPDM there’s no need to worry; Liquid EPDM will not wash off.